When someone becomes a victim of a crime, life gets put on hold. Lives are destroyed, hearts are broken, and nothing is ever the same. The law is designed to keep innocent citizens from being convicted, but often it fails at protecting the victims after the initial crime. In California a law was proposed and approved in 2008 entitled, “Proposition 9—the Victims’ Bill of Rights Act of 2008” or more informally as Marsy’s Law. This act provides victims in the state of California with protection to ensure their rights to privacy and safety are guarded. The list of rights includes freedom from intimidation or abuse, a right to privacy and dignity, reasonable protection from the alleged perpetrator and anyone acting on his or her behalf, consideration in the decision of bail or release of the defendant, the right of refusal for interviews or depositions with the defendant’s attorney, reasonable notice of the defendant’s arrest, reasonable notice of any and all public hearings, the right to be heard at any of the proceedings, a prompt conclusion to the case, the right to compose a victim impact statement for sentencing considerations, a copy of the pre-sentencing report, to receive information on the defendant’s incarceration and release, restitution, the return of property after its use as evidence, reasonable notice of parole hearings, for safety of the victim to be weighed in parole considerations, and to be notified of all the rights described in the Victim’s Bill of Rights Act. Though it may seem repetitive, Marsy’s Law covers quite a lengthy list of rights and guarantees to victims of crime in California. It details several areas of law that apply to the victim, including rights to be informed about hearings and sentencing, rights to have a voice in the process along the way, and the right to be notified if and when the perpetrator is released back into society. These may not sound significant, but if you’ve been through a traumatic experience, it becomes a big deal to know that you will not be blindsided by your attacker at the grocery store. It can also be a major part of the healing process to reclaim your voice and take part in the trial and sentencing by verbalizing the effects of the crime. Marsy’s Law takes its name from Marsy Nicholas, a senior at UC Santa Barbara was stalked and eventually murdered in 1983 by her former boyfriend, Kerry Conley. Though he was convicted and sent to prison, her family faced a frustrating lack of legal protection. As a result, her brother Henry Nicholas, an executive of Broadcom Corporation, was influential in the organization and sponsorship of Marsy’s Law. Over the past several years’ crime rates in the Los Angeles, Southern California area have been reported as declining. Yet recently it has been reported by various sources that after several years of decline in crime in the Los Angeles area, the crime rates are once again on the rise. In the past several months the Los Angeles Police Department has publically addressed this issue in the news media. The Department has recently spoken up and reported on an increase in crime for the beginning of 2015 of approximately 12.7%. However other sources report that the increase in violent crime is up as much as 20%. The Department has addressed what they believe to be the various causes of this recent uptick in crime. According to the Los Angeles Police Department some of the factors contributing to this current increase appear to be attributable to possible misclassification of crimes committed, an increase in the gang population and the violence connected thereto, a forever widening economic gap, increased homelessness, and declining social services. These combined factors create a hot bed for an increase in criminal activity. In addition to the social and economic factors stated above, the Los Angeles Police Department is also siting Proposition 47 as a contributing factor to the increase in crime rates. Proposition 47 was recently on the ballot in California. The voters approved Proposition 47, setting into motion a change in the classification of crimes. Proposition 47 is also known as the Safe Neighborhoods and Schools Act. The proposition recategorized some of the non-violent crimes as misdemeanors, rather than felonies. However the police department claims that none of the intervention programs promised by the proposition, to support the change in crime categorization, have been implemented. Therefor the community is lacking in the support that is needed to combat the recent recategorization. In an effort to rise to the challenge the Los Angeles Police Department is putting officers through new training procedures. As a result of the increasing crime trend officers have been required to participate in additional training to prepare them to handle situations that escalate or involve the mentally ill. In addition, the officers are being increasingly trained in using “predictive policing”, a tool that enables them to use their current skills with greater efficiency, including being problem oriented, using greater community policing strategies, stronger intelligence information and being increasingly aware and alert for “hot spots.” It is hoped that using all of these combined efforts of increasing the predictive capabilities of the officers and elevating their on street skills, will contribute to stemming the increase in crime and eventually reducing the uptick in criminal percentages. 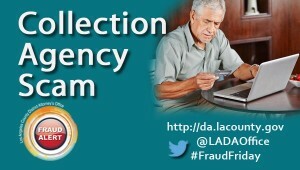 The Los Angeles County District Attorney’s Office issues out a press release on how thieves, claiming they are from collection agencies, are targeting and defrauding senior citizens. These thieves will make threats to the victims unless a payment is made, as well as sell the senior’s information for further fraud.